I am in the cast of The Dining Room, a play by A.R. Gurney, currently running at Center On The Square in Searcy, AR. We have one more weekend of shows, but that’s not what I’m writing about today (though it is the reason I have been away for a time). 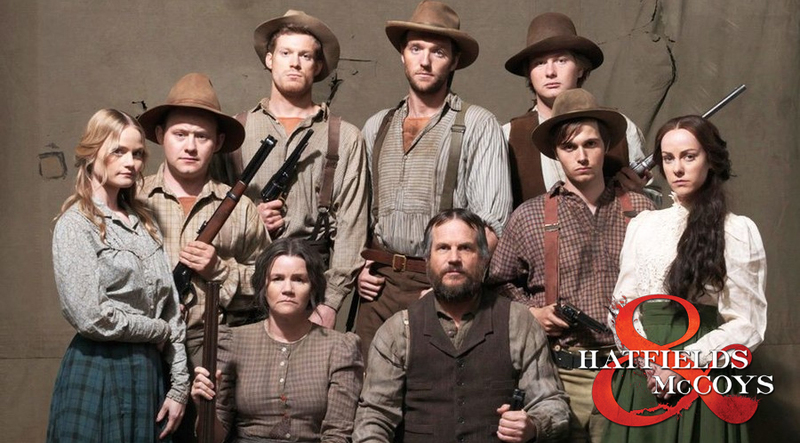 Last week the History Channel presented The Hatfields and McCoys, a six-hour mini-series spread over three nights. If you missed it, just check your listings, it will be re-run several times I’m sure. After all, this is cable. I didn’t watch the whole series, though I probably will eventually. Besides not really having six hours to spend sitting in front of the TV, I found the story, starring Kevin Costner and Bill Paxton, to be a graphically cruel bloodbath. At work there was much talk about each episode. Most who had watched it closer than I, felt it was historically correct and very well done. Though there was the complaint that at the end of the final episode, when each character’s picture and a short synopsis of their life was shown, it scrolled past so rapidly one would have to be a champion speed reader to know what it said. Well, you see, I’m a Hatfield in name only. I married this name. And even though I have been called a Hatfield for 33 years, I am the most peace-loving, non-confrontational, moderate-in-favor-of-gun-control you will ever meet. If I have ever held a gun in my hands, I can’t remember when it might have been. I’m also pretty forgiving – and a little forgiveness at any point would have gone a long way toward ending the hatred that caused the killing. According to the ratings, this epic drama was well received. Even after almost 150 years, the stories about this legendary feud still capture people’s interest.